We've introduced the Form Builder - a new way for you to add customized forms to your website. Updates within the top navigation of Agility allow you to customize the links in the navigation to whatever suits your needs. There are now complex passwords for Agility users. If you want your users to use complex passwords, you can now set this requirement from within your Agility instance. 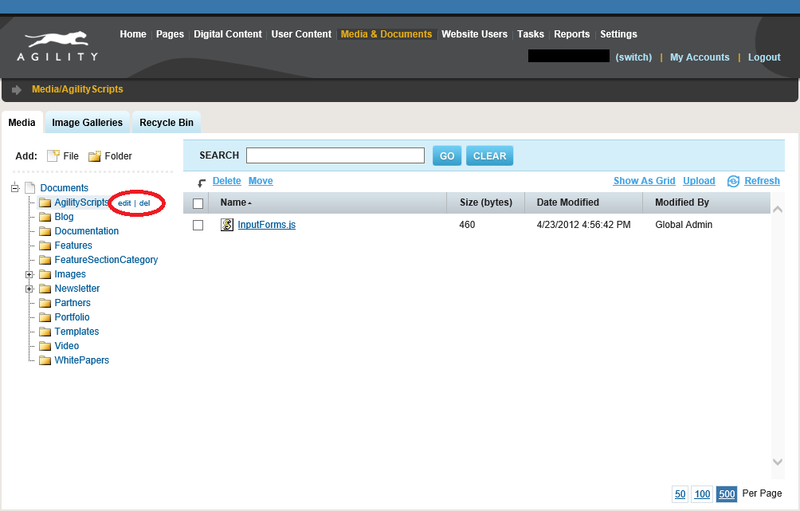 You now have the ability to easily move files to different folders from within the Media & Documents section. Provides an easy way for Agility users to add and customize forms to the website. Requires no experience with HTML. Users can customize their own forms, or use the ones generated by Agility. Forms can be generated using any existing user content definition in Agility. These forms can be used on the website (contact us, contest submissions, testimonials). Form data can either be stored in UGC as submitted data or be sent as an Email. Once a user completes and submits the form, they can be presented with a Thank You message, or be re-directed to a given URL. In either case, they can also customize the templates that are used for the Email and Thank You messages. IMPORTANT NOTE FOR CUSTOMERS: You must contact your development team or Agility Support in order to have this feature activated if your site is not hosted through Agility in Windows Azure. IMPORTANT NOTE FOR DEVELOPERS: The Form Builder requires updated versions of both the Agility.Web.dll and the Agility.UGC.API.js files. Both are available in the Settings sections of Agility under 'Developer Downloads'. Agility users with the Administrator role can now choose to adjust the position of links in the top navigation bar as well as create custom links that point to any URL. This is especially useful to create shortcuts to Pages, Modules, or Content Lists directly. Navigate to "Settings" by clicking the link in the top navigation bar. Next, find the sub-section called "Settings" and then click the link labelled "Top Navigation." Select an item from the list by selecting its corresponding checkbox and click the links labelled "Up" or "Down" and that item will move up/down the list respectively. Click the "New" link at the top of the list. This will launch a new window allowing you to enter the Text that appears as well define the URL. What Happens With Many Links? If you have multiple custom links defined, they may have room to appear in the Top Navigation. However, they will still be available under the "More" link. Update to allow users to move files within the Media & Documents section. Select 'Move' on the top left. Select the folder you wish to move the file to. NOTE: Moving folders to a new location will change the path to the files within that folder and break links within the site. Please move with caution! Within the Media & Documents section of Agility, the option to edit and delete folders is now displayed more prominently. Go to Settings in Agility. Select one of the following options from the Password Strength drop down: Weak - anything goes; Medium - at least 6 chars, with upper & lowercase; Strong - at least 8 chars, contains a combo of at least three: uppercase, lowercase, number, non-alphanumeric. 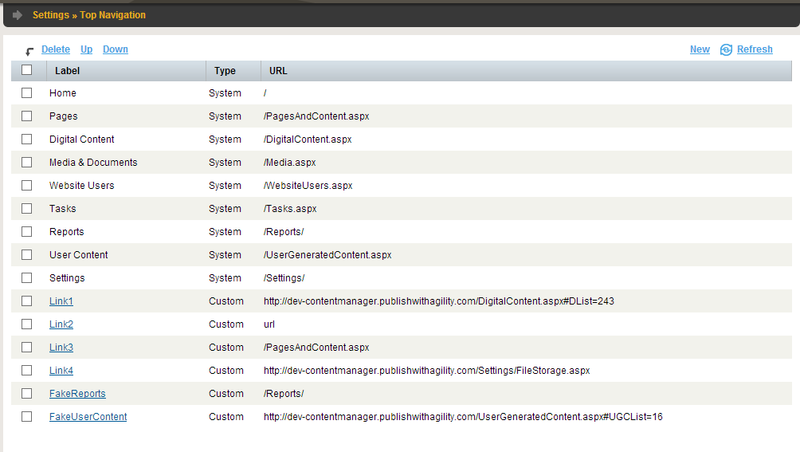 Bug fix to Agility.Web.Data.GetPage to return first page in sitemap. Updated "MVC Controller with Partial View" radio button label to read "MVC Controller Action"
Update in: Settings > Module Definitions > Output Template to "MVC Controller Action"
In reality this has nothing to do with a Partial view and rather invokes a controller action which can return ANY partial view as specified in the code, therefore it has been updated. Updated Reports section to enforce higher security restrictions based on user account permissions. Click if you'd like to read the March 2013 Full Release Notes.